Littman Brands presents new designs from their renowned lighting families, Hudson Valley Lighting®, Corbett Lighting, and Troy Lighting at this year’s Dallas International Lighting Show, now known as Lightovation. The expansive collection includes over 250 new exquisite chandeliers, exceptional pendants, and a multitude of sconces and flush mount fixtures incorporating crystal, acrylic and mixed metals. 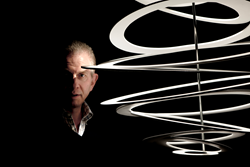 David Littman - Founder and chairman of Littman Brands, parent company of Hudson Valley Lighting®, Corbett Lighting and Troy Lighting. Once more our dedication of producing light fixtures that evoke something so much more than the light they emit – has put our collections for 2016 ahead of the industry. Hudson Valley Lighting®, Corbett Lighting, and Troy Lighting once again redefine the lighting industry with progressive product designs. 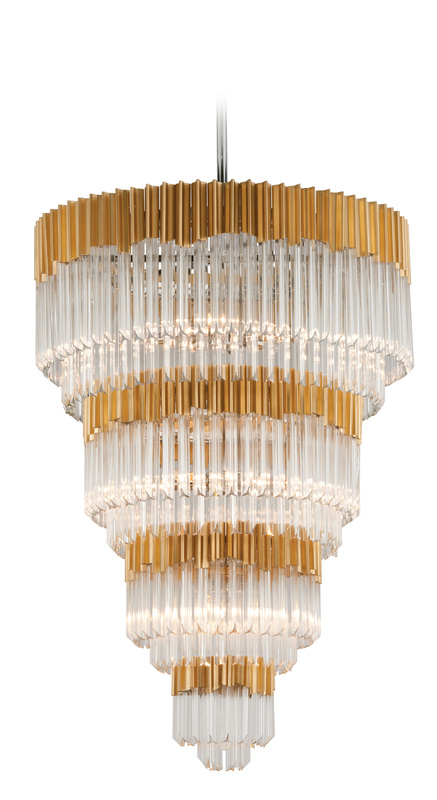 The expansive collection, which debuted at Lightovation 2016 includes over 250 new exquisite chandeliers, exceptional pendants, and a multitude of sconces and flush mount fixtures incorporating crystal, acrylic and mixed metals. These newest collections are the perfect choice for residential, retail, office and hospitality specifications. Hudson Valley Lighting® presents its newest collection of European-inspired and contemporary designs. Each year, Hudson Valley Lighting takes more design risks and outdoes the previous year’s collection – and for 2016, it’s no different. For the first time, Hudson Valley will feature new families in a new combination of fine textured black and plated finish, colorful crystal globes inspired by Paris flea markets and their first use of rock crystal. With the debut of 2016 collection, Corbett Lighting has reinforced their name as a leading designer of fashion-forward designs. The collection takes lighting to a sculptural art form with unique, innovative designs in pendants, chandeliers, semi-flush mounts and sconces that incorporate lavish adornments of Venetian glass with 24K gold finishes, ’70s inspired triedi crystal, decorative piastra glass, alabaster stone, and handcrafted iron and stainless steel stems. Troy Lighting displayed their newest lighting designs at Lightovation and charmed the crowd. Famous for its “sophisticated casual” designs, Troy’s latest creations stay true to Troy Lighting’s transitional aesthetic with sculptural creations in hand-worked wrought iron, aluminum and pressed, frosted and smoked blown glass. Troy combines these unique elements to create distinctive products that are original works of art. 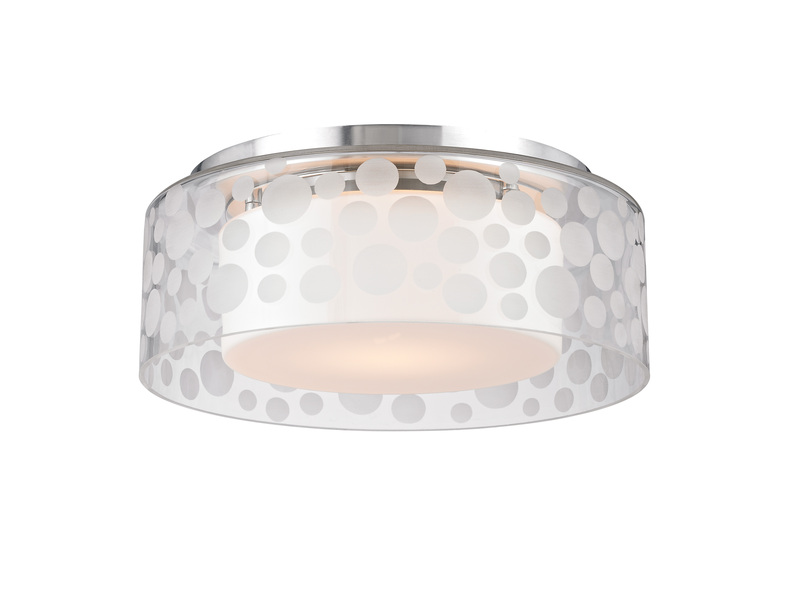 Carter merges LED technology with artisanal glasswork for a very unique flush mount. The outer floating glass ring shows off hand-cut circles. Malden is all about the shade and the shape. The shades are large with a unique, gentle curve. Their delicate pleats contrast with weighty tubing for the rest of the fixture. The delightful Charisma collection packs a world of personality into any space. Charisma’s clear triedi crystal forms are arranged in a circular, tiered formation, resulting in a retro design with a new and fresh feel. The crystal is complemented by iron extrusions made and capped in gold leaf while a stainless steel frame sparkles from the inside. Charisma is offered in four pendant sizes as well as one flush and two sconces. Voilà is an attention-getting LED sconce with a dazzling appearance. Pieces of handmade clear Venetian glass are arranged by height and held in place by a handcrafted iron frame. The beautiful Italian glass is handmade by the original company that made original triedi crystal. While the glass looks like it was cast, it is completely handmade. The glass is offered in two finishes: gold leaf with gold flecks embedded into the glass and silver leaf with silver flecks embedded into clear glass. Voilà is ADA compliant and offered in two sizes. Maddox combines clean lines and shapes to create a unique, industrial form. The bold fixture is constructed of hand-worked iron finished in a dark textured bronze. The outside rectangular frame holds panes of clear glass, while the inner open cylinder frame contains a simple, classic cluster with thin and curvy arms. The resulting effect creates a solid look that’s still lighter than air. Maddox is offered with early electric or early electric LED bulb options in two pendant sizes and a wall sconce. Chrysalis is a transformative design inspired by nature’s most celebrated metamorphosis. The pendant’s beautifully hand-hammered and finished iron outer frame is finished in cottage bronze with leafing, which adds extra luster to the design, while the inner frame is made of gleaming stainless steel. Adorning the inside is a beautiful arrangement of handcrafted, sculptural branchwork and gold leaf butterflies. Chrysalis is offered in two pendant sizes and accompanying wall sconce. Since 1985, Hudson Valley Lighting® has been producing distinctive products of outstanding quality and value for residential and contract settings. From the brand’s New York-based headquarters, an in-house team creates unique and original fixture designs, spanning in style from historic to artisan, transitional to contemporary. Brand hallmarks include exquisite detailing, fine finishes, hand-forged metals and strong craftsmanship. From a variety of pendants, chandeliers, sconces, bath bars and flush mounts, to portable floor and table lamps, designers, specifiers and consumers are assured of extensive, top quality options. 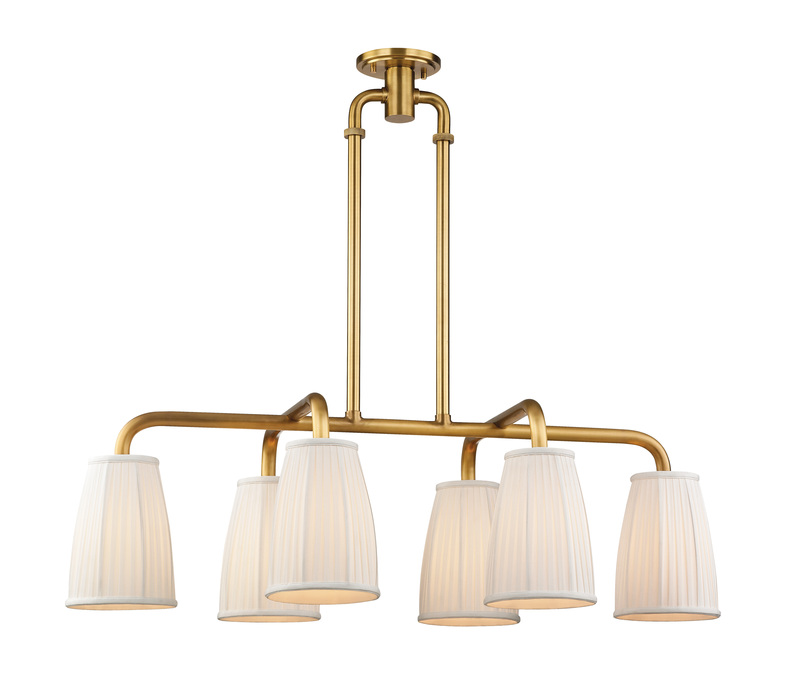 With more than 150 collections in its catalog available throughout North America through dealers and showrooms, Hudson Valley Lighting retains an impressive library of products to suit virtually any residential, commercial or hospitality project. For more information on the brand and its products, visit: http://www.hudsonvalleylighting.com. For more than 40 years, Corbett Lighting has created and manufactured lighting for residential, hospitality, commercial and contract markets. Corbett Lighting’s superb craftsmanship and revered commitment to fine detailing and finishes are major brand characteristics and are evident in every beautiful design. From bias cut crystals to delicate Japanese papers, Corbett Lighting uses only the most stylized and refined materials to reflect the latest trends in fashion, design and lifestyle. Adhering to meticulous manufacturing standards, Corbett Lighting not only maintains a level of consistency in production, but produces pieces that are superior in quality and unmatched in execution. Corbett Lighting also makes available a large selection of wall sconces and pendants to accommodate a wide spectrum of projects and applications. With its inclusive, on-site manufacturing facility, Corbett Lighting is able to produce custom lighting solutions that exceed even the most exacting standards. For more information on Corbett Lighting, visit: http://www.corbettlighting.com. Best known for its “sophisticated casual” aesthetic, Troy Lighting has graced the interiors and exteriors of the finest homes worldwide for 50 years and counting. Their rich catalog of products can fulfill even the most unique design inspirations, exuding quality, design and value. Troy Lighting’s team of expert craftsmen create one of a kind, hand-forged lighting fixtures for the most discriminating residential and commercial clients and take great pride in engineering and inspection standards to ensure high-quality products. Their firm commitment to the environment led to the development of the Troy Lighting Environmental Series, which combines exquisite, hand-crafted designs with compact fluorescent, LED, Energy Star and Dark-Sky compliant options. For more information on Troy Lighting, visit http://www.troy-lighting.com. Littman Brands is renowned for unique custom designs and high-quality lighting solutions for the residential, hospitality and contract arenas. Led by Founder and Chairman David Littman, whose family has maintained a key leadership role in lighting design for more than 85 years, Littman Brands is represented by four distinct brands: Corbett Lighting, Hudson Valley Lighting®, Troy Lighting and CSL® (Creative Systems Lighting). Each brand reflects an individual identity and specialization while maintaining the promise of uncompromising quality, expert craftsmanship and groundbreaking design. For more information about Littman Brands, visit http://www.littmanbrands.com. For more information about the new collections, please contact DRS and Associates: David Schlocker at david@drsandassociates or Amanda Telson at amanda@drsandassociates.com. Chrysalis by Troy Lighting - Chrysalis is a handcrafted, sculptural pendant adorned with a beautiful arrangement of branchwork and gold leaf butterflies. Maddox by Troy Lighting - Maddox combines clean lines and shapes to create a unique, industrial form. The bold fixture is constructed of hand-worked iron finished in a dark textured bronze. Carter by Hudson Valley Lighting - Carter merges LED technology with artisanal glasswork for a very unique flush mount. Malden by Hudson Valley Lighting - Malden is all about the shade and the shape. The shades are large with a unique, gentle curve. Their delicate pleats contrast with weighty tubing for the rest of the Charisma by Corbett Lighting - The delightful Charisma collection’s clear triedi crystal forms are arranged in a circular, tiered formation, resulting in a retro design with a new and fresh feel. Voilà by Corbett Lighting - An attention-getting LED sconce with a dazzling appearance. Pieces of handmade clear Venetian glass are arranged by height and held in place by a handcrafted iron frame.